The Silverado-Modjeska Specific Plan is a county document passed by resolution of the Orange County Board of Supervisors in 1977. 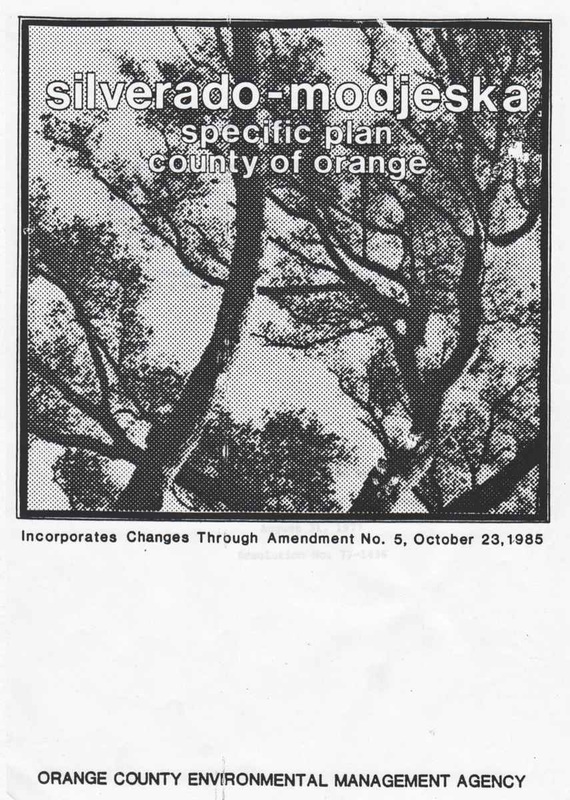 It is among the oldest of the county's specific plans, and is a companion document to Orange County's general plan. The Sil-Mod Specific Plan is available for viewing at the right. Or you can download the plan and map by clicking the "Download File" links just below. The Sil-Mod Specific Plan was derived from a comprehensive study and EIR called the Sil-Mod Community Plan, which is also available for download in the next section. ​The Sil-Mod plan governs development in the areas generally between and including Silverado and Modjeska Canyons. The actual contours of the plan area follow the natural watershed boundaries, shown in the downloadable area map. ​The main purpose for creating the Sil-Mod Specific Plan was to provide a legal framework to protect the area from inappropriate development and urban sprawl, whilst still allowing for reasonable development. The email at the right was received from 3rd district supervisor Todd Spitzer on October 27th, 2016. It was in response to a legal opinion funded and submitted by the ICL and other canyon groups. It was written by respected local land-use attorney John G. McClendon. The memo affirms the legal enforceability of the Sil-Mod Specific Plan. You can download the McClendon legal opinion using the link below. Sup. Spitzer's directive to OCPW. The Sil-Mod plan above is a short, 11 page document that formalizes requirements derived from a consulting study conducted in the mid-1970s called the Sil-Mod Community Plan. The Sil-Mod Community Plan is over 200 pages long and contains detailed study evaluations, maps, tables, forecasts and an environmental impact report. One of the first such plans in Orange County, the Sil-Mod Community Plan was conducted at a cost of $35,000. Later plans, such as the neighboring Foothill-Trabuco Specific Plan study, would run to costs of over a million dollars. At the time of the Sil-Mod plan, Orange County still had a vibrant agriculture base. Orange groves and strawberry fields were prevalant. The new, master-planned community of Irvine was just a few years into existence. In that context it is of note that Orange County's third district supervisor and county board chairman at the time was Ralph A. Diedrich. Not long after the Sil-Mod plan was adopted, Diedrich (often dubbed "Super D"), was convicted on three counts of bribery and consipiracy for voting to approve an Anaheim developer's rezoning application to convert 2.200 acres of farmland for apartments. Thanks to ICL's very own Judy Myers, co-chair of that original Sil-Mod committee, we are able to provide the complete Sil-Mod Community Plan - coffee stains and all - for viewing and download here. This is the plan at high resolution. The large foldout maps are not in this, but can be downloaded separately below. Or the complete download below that includes these maps. All pages are 8.5" x 11" portrait, so this is suitable for printing. This is the complete plan document as above, but it has been compressed to a lower resolution that reduces its size about 70%. The text and image quality is correspondingly less. These are the four, large fold-out maps that are omitted in the downloads above. • Two concept maps for the Santiago Corridor. These go at the start of Sec. 6.3. • A land use map that comes after page 44. This is the entire Sil-Mod Community Plan, including the large-format maps. Landscape-formatted pages with tables have been rotated for viewing. This is the best download for viewing the report, but it may be more difficult to print. It is also the largest download. 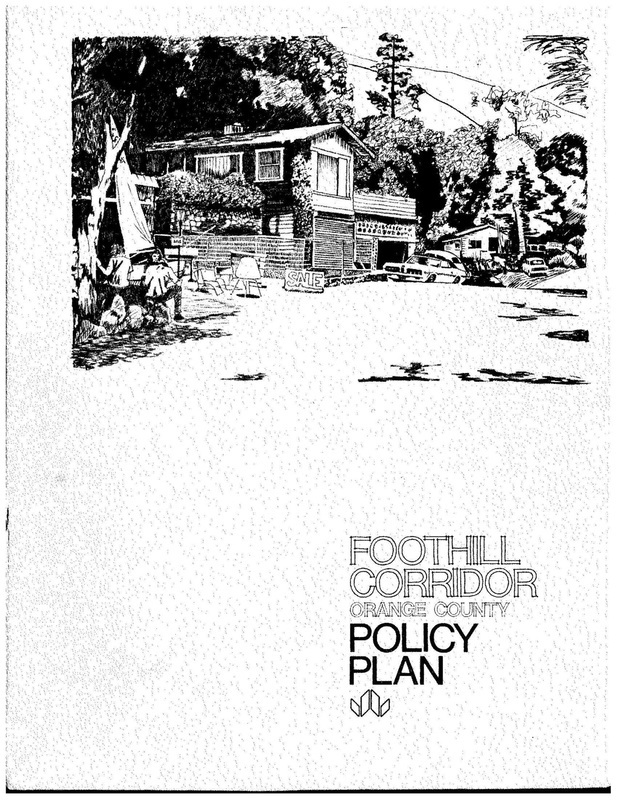 The Foothill Corridor Policy Plan was the initial study conducted in 1974 across the entire eastern region from Irvine Regional Park, south through Coto De Caza. It covered a large area of 120 square miles. It was privately funded by citizens and landholders of the area it covered. The Corridor Plan provided interim planning guidance to the county, and it proposed the framework for the formation of various community-specific studies. One of those studies was the Sil-Mod Community Plan above. This download is approximately 18MB. The text pages are 8.5"x11", but there are a number of fold-out maps.